Better than new! 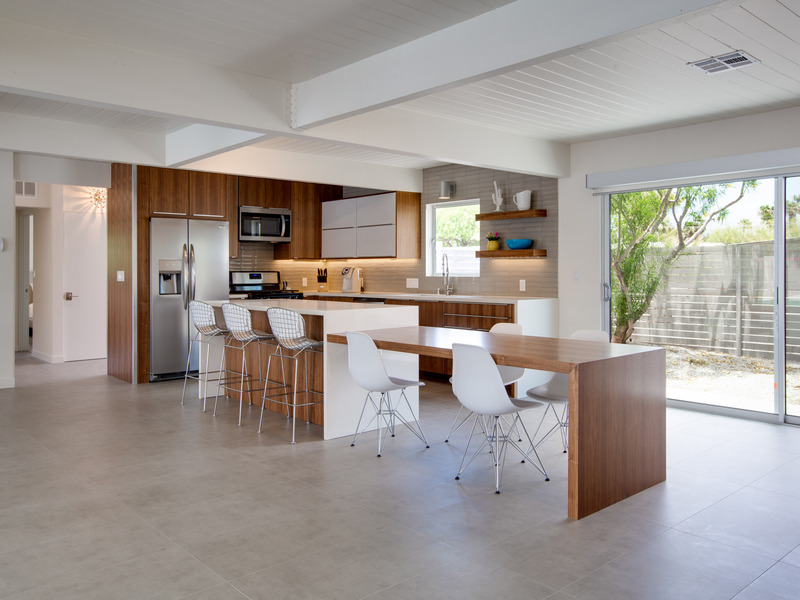 Totally remodeled and expanded Midcentury Vacation Home Rental originally designed by starchitects Palmer & Krisel. 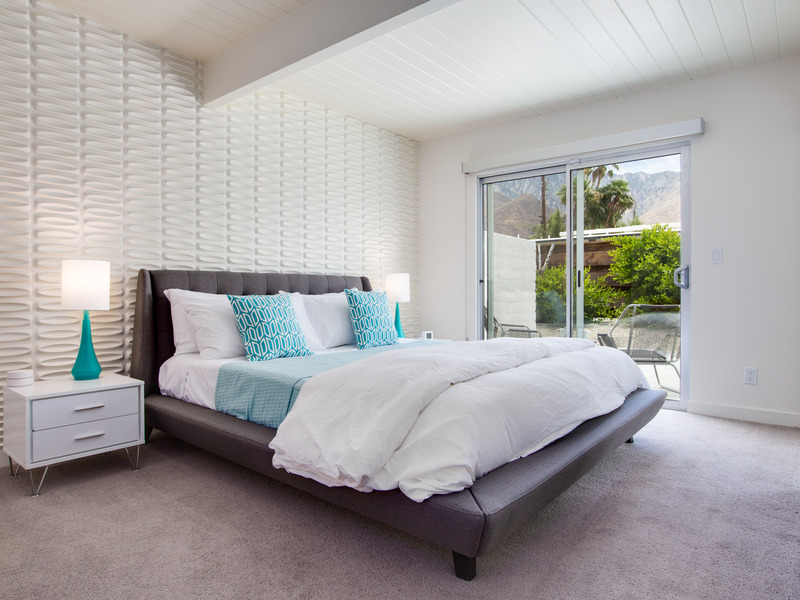 Now nearly 2,800 square feet of Palm Springs decadence. Sprawling open concept floor plan. High vaulted ceilings. 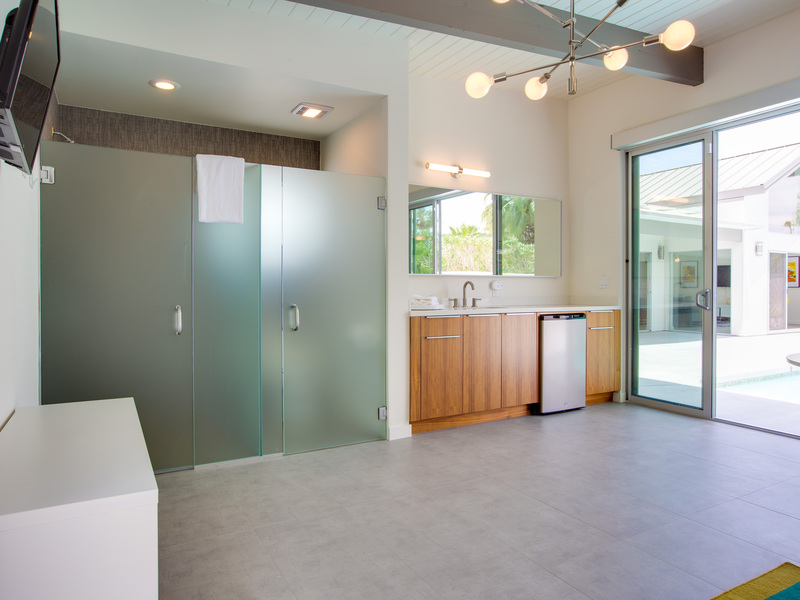 Walls of glass that let the light shine in - blurring the lines between indoor and outdoor living. The Main House is 4 Bedrooms / 2 Baths plus there's a cabana pool house that's ideal for napping, and overflow. Great for extended families! 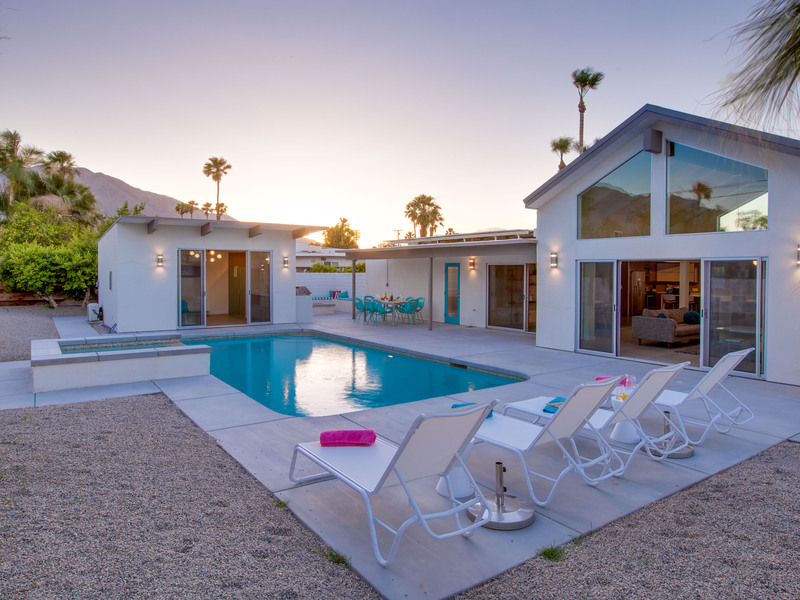 The fabulous resort-style pool yard has been created for relaxing in the Palm Springs sunshine. At the center of it all is the huge heated inground swimming pool with integrated waterfall spa. The entire pool yard has been walled and gated for privacy. 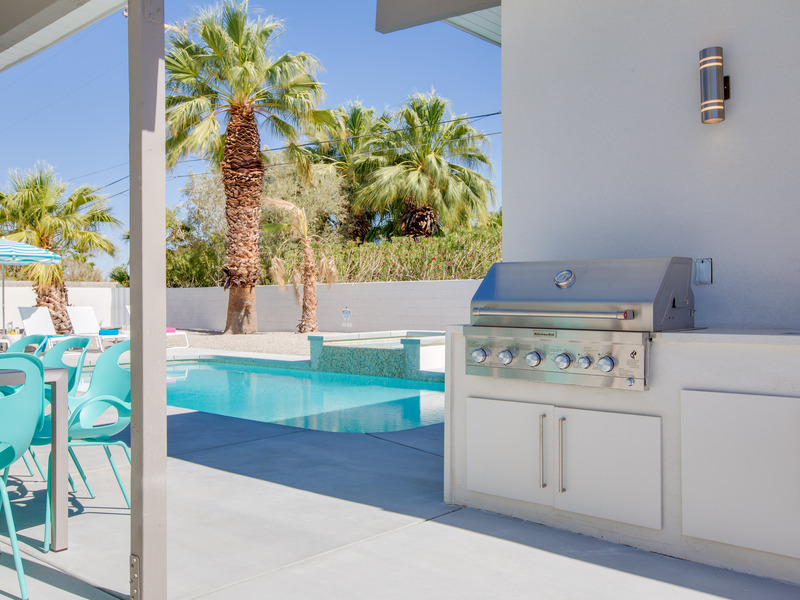 You'll find spectacular mountain views, chaise loungers, shade umbrellas, alfresco dining, an outdoor cook area with hard-lined gas feed, and a built in firepit lounge that seats 8-10 comfortably. 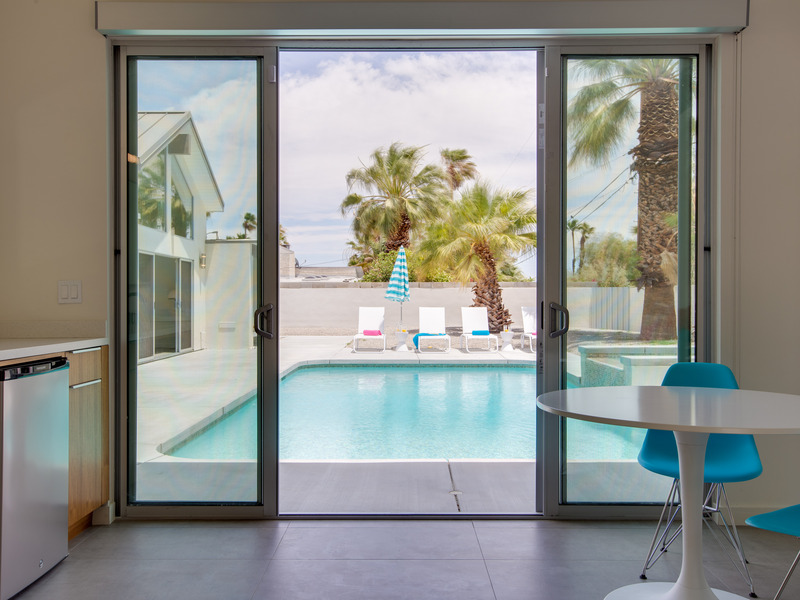 Dive-In Palm Springs has been created as the ideal desert getaway where the focus is on easy, livable comfort. Gorgeous but not pretentious. Beautiful yet family-friendly. This is the type of home where you can put your feet up, relax and enjoy a stress-free, worry-free vacation. 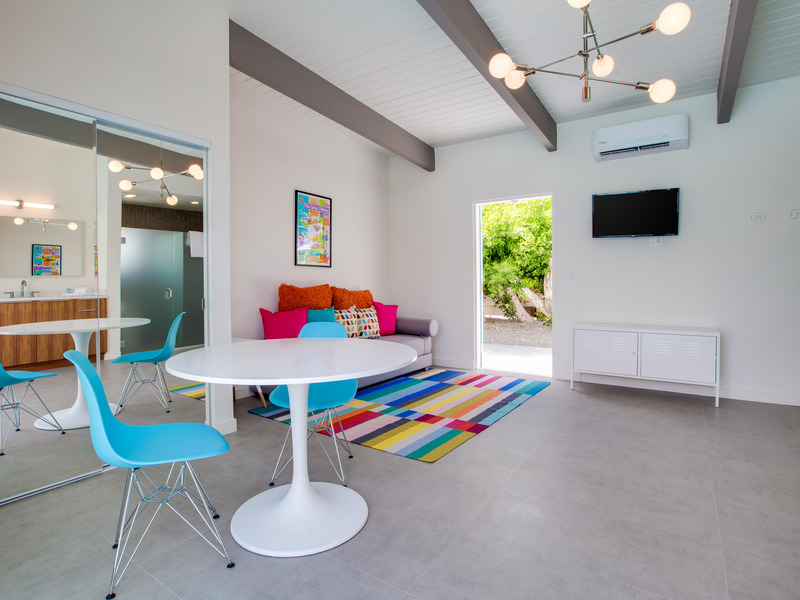 The interior living areas have been perfectly space-planned for spending time with your entire group or stealing away for some alone time to curl up with a good book. The open concept floor plan is bright and happy. 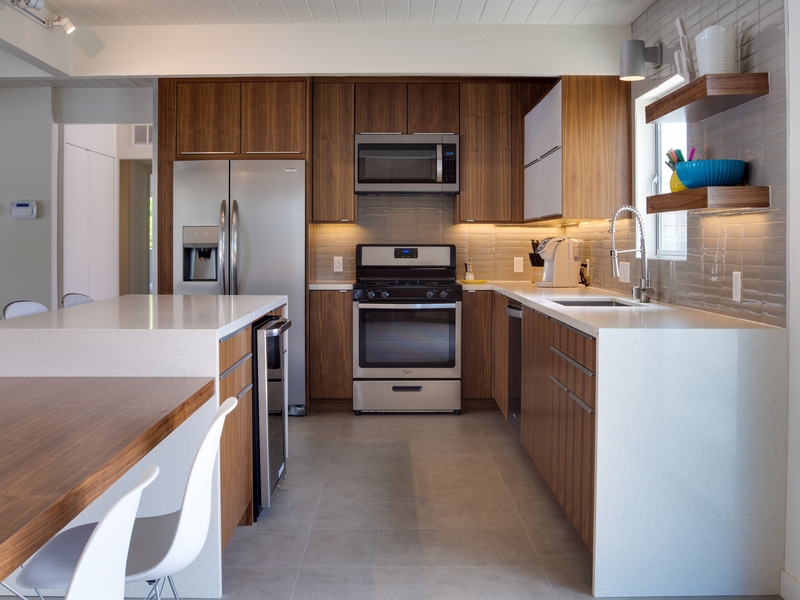 The oversized center island kitchen is perfect for individual or group meal prep. The interior dining easily fits 8-10 guests. The two story living room reveals the fabulous pool yard and mountain views. 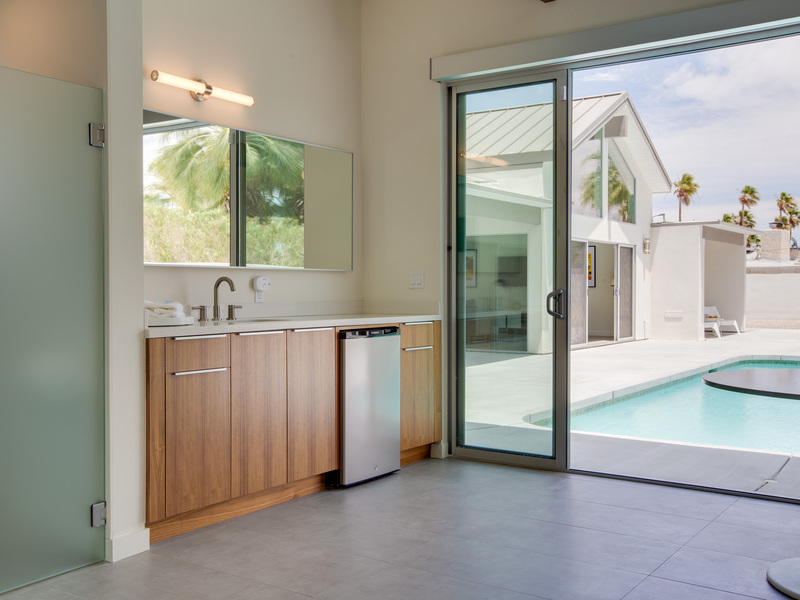 The detached poolside cabana has a game table, wet bar, flat screen television, full bath and a napping sofa. 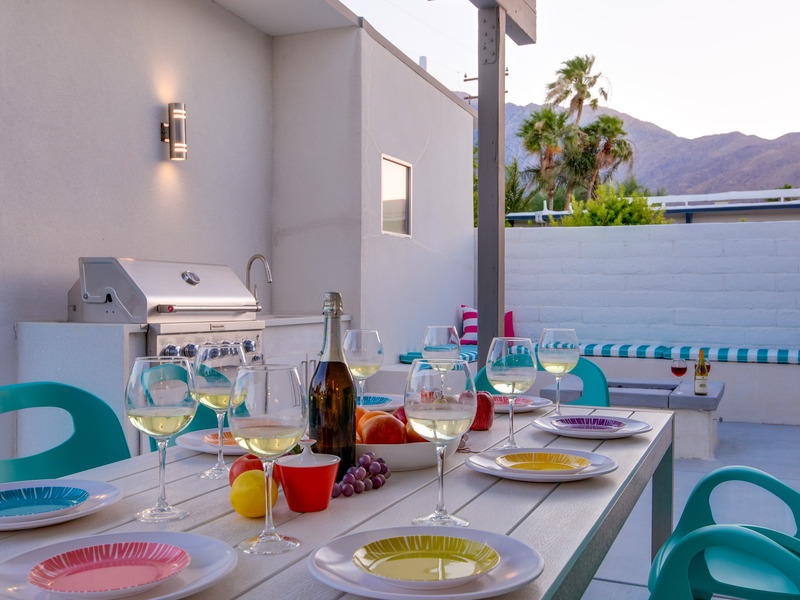 Perfect for overflow guests and hanging out days or nights. 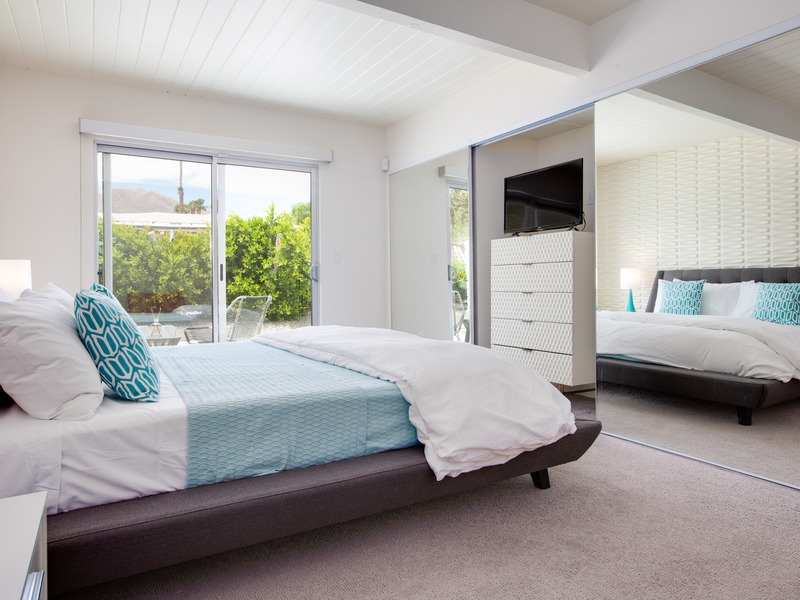 There are 4 bedrooms in the main house plus a poolside napping cabana. 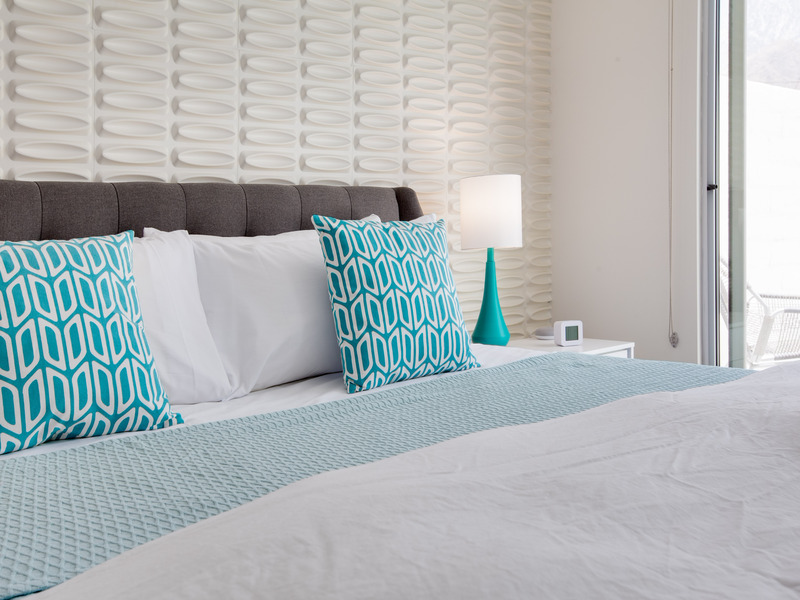 All of the bedrooms feature comfortable hospitality-quality mattresses, ample storage, and flat screen televisions. Beds: King, King, Queen and King that can be converted to two twins upon request. There is also a napping sofa in the poolside cabana offering an alternative for sleeping arrangements. 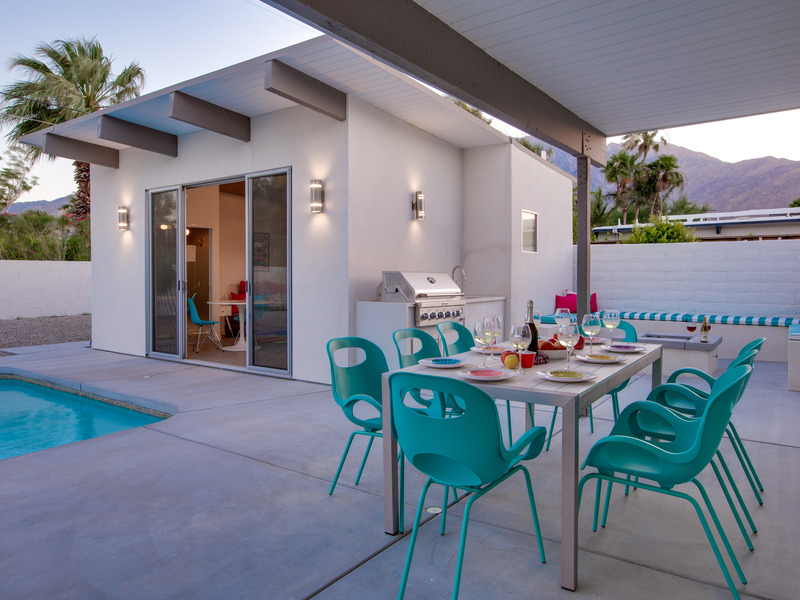 As beautiful as the interior spaces are at Dive-In Palm Springs - it is the outdoor spaces that are the crowning glory. 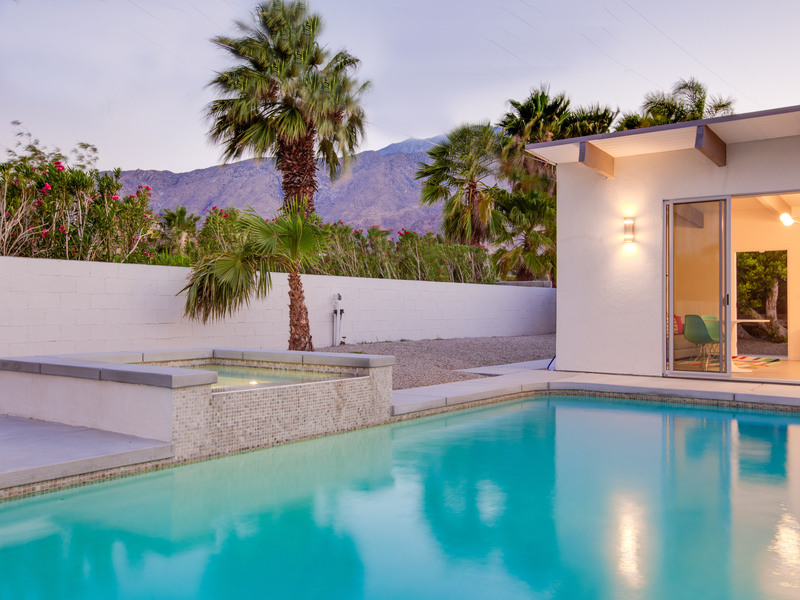 Completely walled and gated for privacy - the entire yard has been space planned for relaxing in the Palm Springs sunshine. There are so many different spaces for spending time with your travel mates. 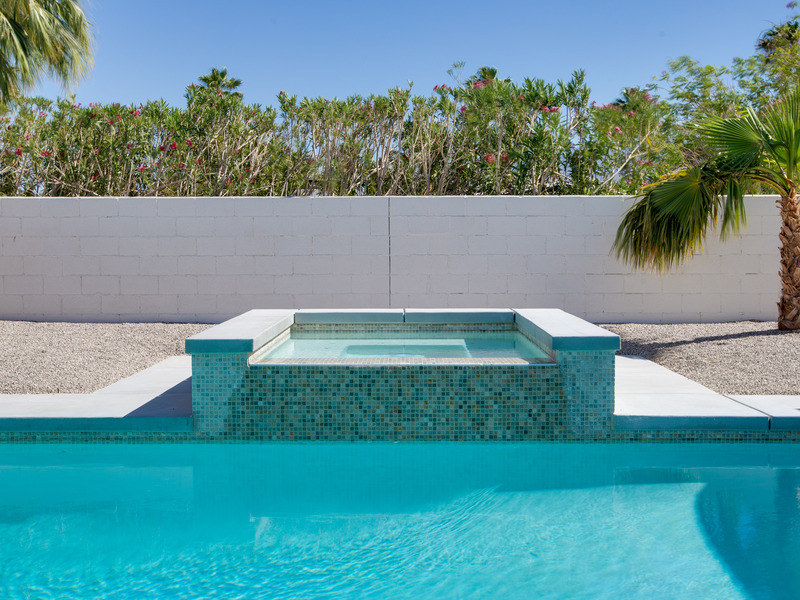 At the center of it all is the fabulous inground pool and integrated waterfall spa. 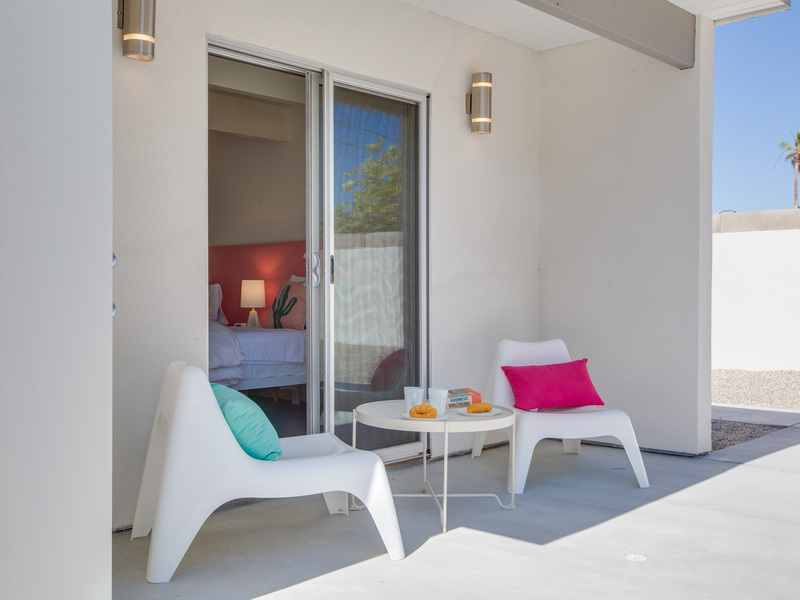 You'll find al fresco dining, a built in cook area, a fire pit lounge, chaise lounges, and shade umbrellas. 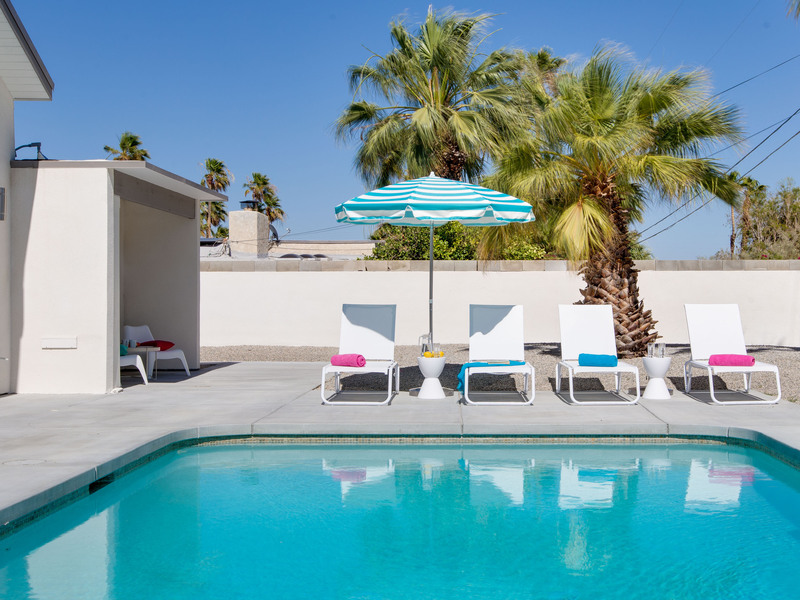 Dive-In Palm Springs was created for Jet Setters who want to go from travel to poolside in a matter of minutes. 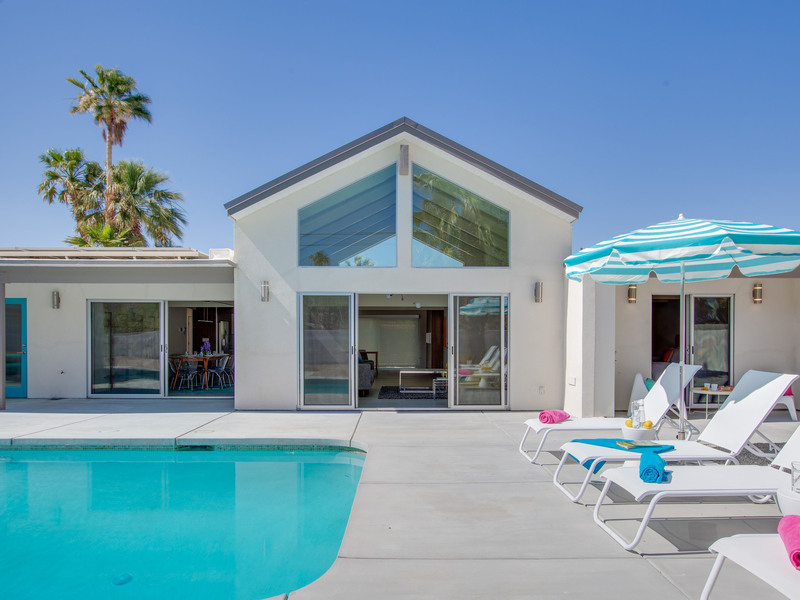 Located in a quiet residential neighborhood less than a mile from the world famous Palm Canyon Drive - you will be right near everything! You'll find the area's finest restaurants, fast casual eateries, shops, boutiques and galleries are all just minutes away. The casino, convention center, cabarets, dance clubs and entertainment venues are very close. Neighborhood conveniences like grocery stores, coffee houses and specialty shops are all less than a mile from your door. Private chef, pre-arrival grocery stocking, daily maid service, and poolside massage can be arranged with three weeks advance notice. "Great value. 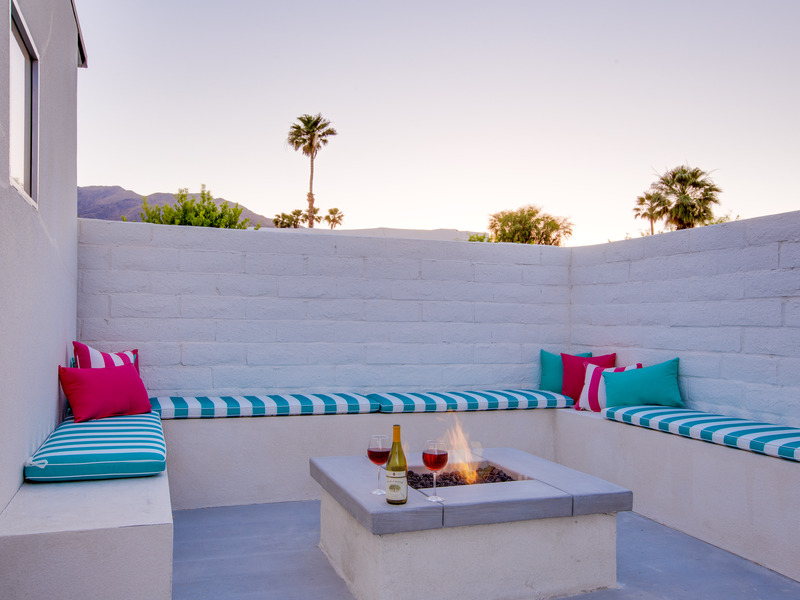 You get a whole lot of house for the money and the firepit lounge was the perfect place for cool desert evenings. We will certainly be back. Great pool. Gorgeous Mountain Views." "What a great place to relax. It has everything you could possibly need and is close to everything. Can’t say enough good things about it. It made for such an enjoyable stay for all. The only problem was getting anyone to want to leave the house as we all had so much fun hanging out in the backyard in the pool and spa and by the fire pit. The views from the yard were amazing as well." We loved every minute here! 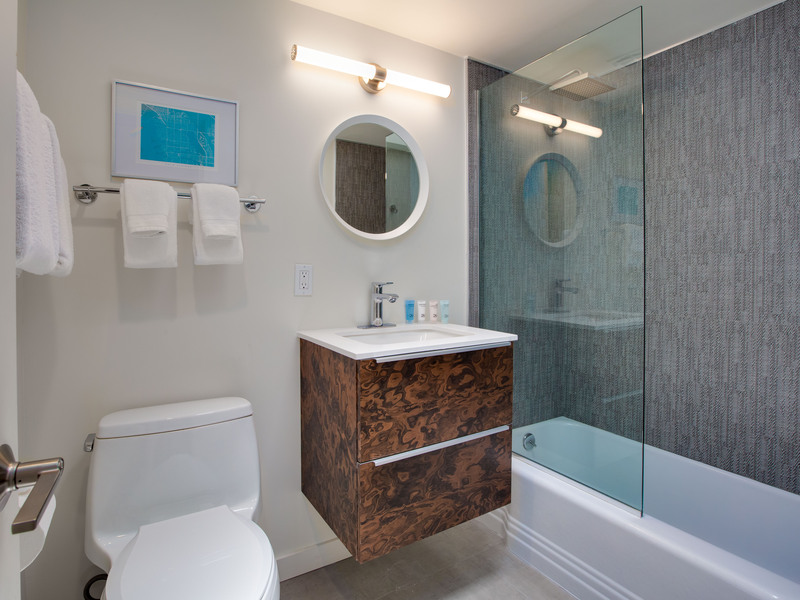 "Clean, well maintained, very stylish and great open floor plan. 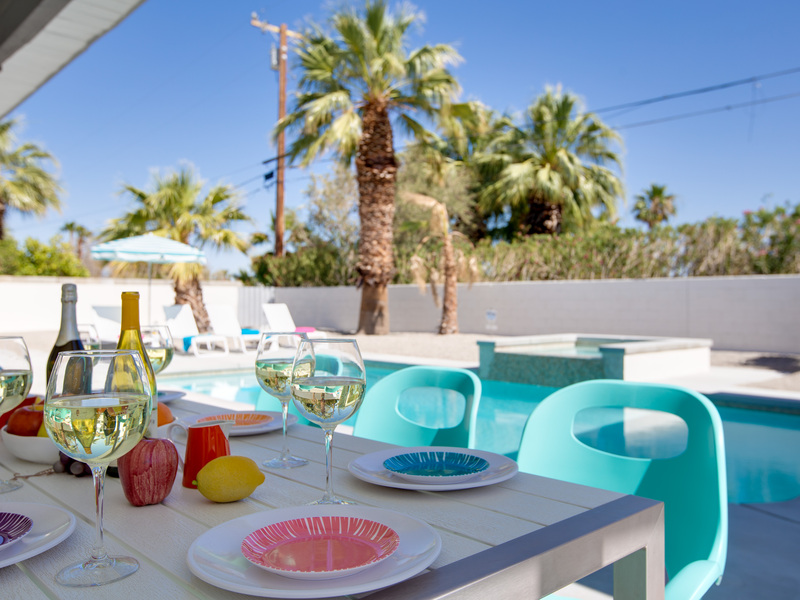 We loved every minute at Dive-In Palm Springs. 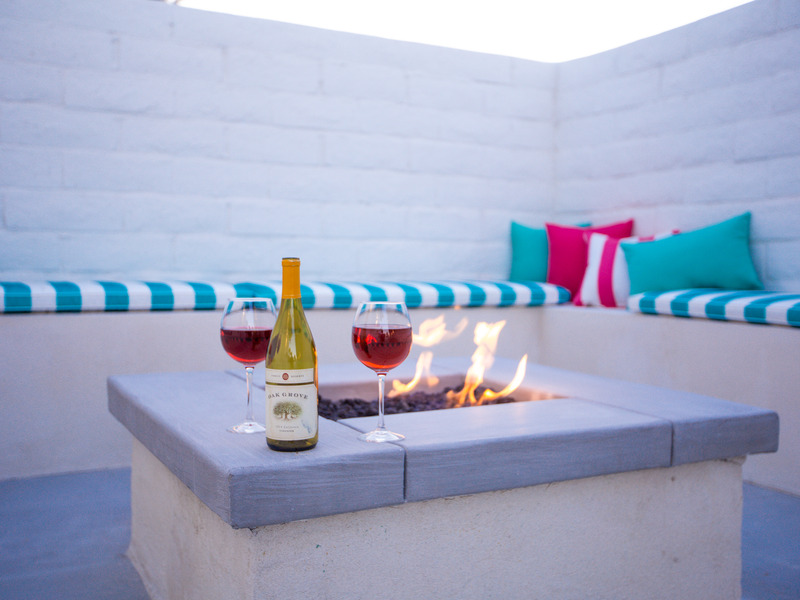 The pool area with the fire pit lounge was just great." 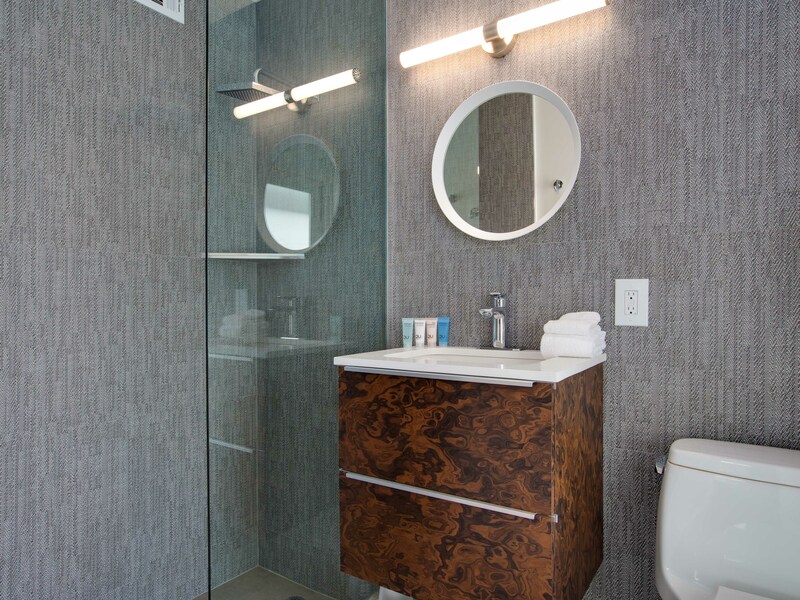 "This was my third rental with Acme and I thoroughly loved it. The house was clean, well appointed and very roomy for 4 couples. The rooms were more evenly sized (not a massively larger master suite) so that was better for us. Their was only a slight issue figuring out the pool heater but someone came to help us within minutes, and it was fixed. The extra casita was perfect for those that needed a little private time away from the rest of the group. I would definitely stay here again!" Stunning! Huge! Better than New! "We may have been the first people to rent this vacation home. It was absolutely immaculate! Better than new. Great open layout floor plan. Huge well-stocked kitchen. Super private pool yard. Highly recommend."